The sun is out and it’s time for Frogtown’s Backyard Celebration! Come on over to Frogtown Park and Farm on Saturday, June 3rd, for free food, gardening activities, and games for kids - there is so much to do! Free plants, learn how to build a raised bed and other gardening tips. Gain learning experiences to apply to your own backyard farm! Visit the interactive Hmong village, check out cooking demonstrations and explore neighborhood resources. Learn about the new nature based play area coming soon on Victoria Avenue and see what is in store for the season at Frogtown Farm. 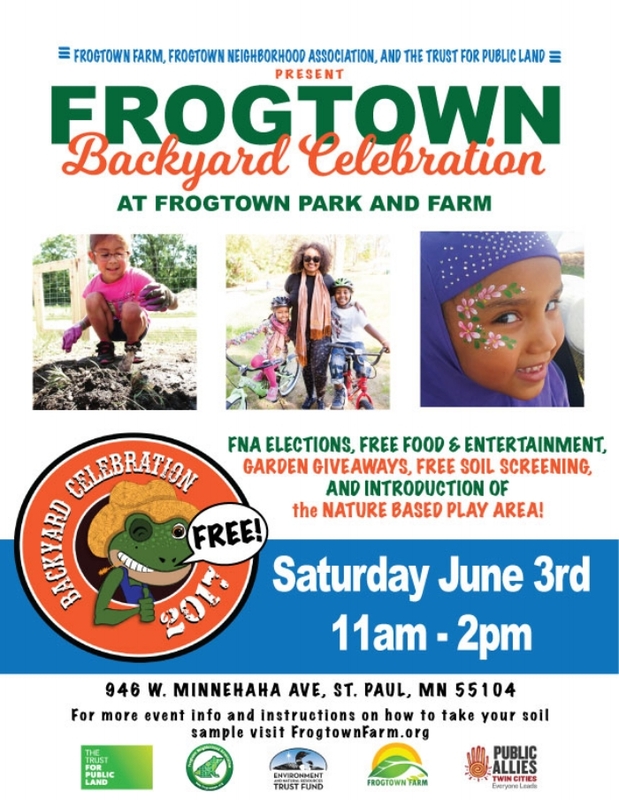 The Frogtown Backyard Celebration event is FREE and open to all. The park is accessible by foot, bike, bus, and the Greenline. On street parking is very limited. Disability parking is available onsite at 941 Lafond Avenue via the Milton Avenue entrance. Volunteer! Help host this fun event while you are visiting. Fill out this form here.